Spotify is prepping the launch of a lossless audio version of its streaming service, according to The Verge. The new subscription tier is said to be called Spotify Hi-Fi and will offer higher bandwidth lossless audio quality to members. Currently, Tidal is the only major music streaming service to offer an optional "lossless" audio tier, although other, lesser known lossless services do exist. Tidal says tracks heard through its "CD quality" lossless service aren't compressed, so users are said to hear the music the way the artists intended – though whether one can tell the difference between compressed and uncompressed tracks can depend on the listener. What Spotify defines as lossless remains to be seen. Spotify began testing the service with a small group of users on Tuesday, according to reports, offering the tier for $5 to $10 above the $10 per month price of a standard Spotify subscription. However, users who received the invitation to sign up for the Hi-Fi service either got an error message or were told the service was unavailable in their area at the time. A Tidal HiFi subscription costs $19.99. Apple Music streams at a bitrate of 256Kbps, while Spotify's current Premium tier streams at a maximum 320Kbps. Apple Music streams at a bitrate of 256Kbps, which is lower than Spotify's current Premium tier at 320Kbps. I wish you guys would stop pushing this myth. I use both services and they have pros and cons. But as Spotify uses Ogg and Apple Music 256kbps AAC it's not comparable on bit-rate alone, so you can't just say this and spread misinformation amoungst other people who don't understand it. 30 years after the compact disk was introduced, Internet Radio stations are finally offering music in CD-Quality. Yes I know Tidal exists and yes I know you could buy Lossless digital copies for many years and yes I know most people can't discern from 256KBS AAC w/ VBR & Losslesss but it is funny that my Mom listening to Pearl Jam's Ten on her Hi-Fi system was better sounding that the majority of people consuming music today. I personally am waiting for Apple to offer FLAC / Lossless tracks in Apple Music. I'm an Apple Fanboy and don't see the point in going another route. I use a 256GB SD Card in my car w/ FLAC tracks and my 256GB iPhone is loaded up with Lossless tracks from iTunes. My Synology has a terabyte of uncompressed music going back to the 50s that I've transferred over from my CD collection. 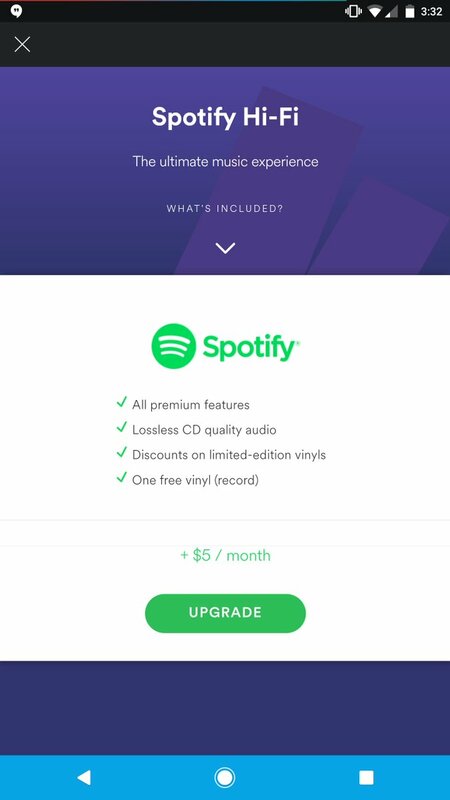 I see no point (personally) in paying $10 a month to listen to music I already own. I only wish Apple had continued with and released a 1TB iPod so I could finally have all of my music with me. I could always do what Puff-Daddy did and just keep multiple iPods on me. I can't find the story but I think he traveled with 5 iPods to hold his entire music collection. So much music is totally ruined by compression and as you say HiRes is not immune from this i started to check files by dragging them into Audacity and was shocked at how compressed some tracks are. I believe Qobuz try to get recordings that are not overly compressed but i doubt if this possible all the time. I think here are 2 types of compression intermixed. There is data compression on one hand, and dynamics compression (loudness wars) on the other. We should aim to seperate those two carefully. "Lossless audio is 44.1KHz 16-bit CD quality, meaning the files aren't compressed..."
This is false. Lossless is about quality, not compression. Lossless audio can be and often is compressed. For example, Apple Lossless (see https://en.wikipedia.org/wiki/Apple_Lossless) maintains lossless quality while reducing file size. So does FLAC. That was an error on my part. So I've removed the word "lower", to avoid that interpretation. It depends more than the listener. MR kinda played it fast and loose with this remark. Sure, I'd hope that was obvious. Ain't this topic a minefield! Why high quality music has higher price? If those codecs are just provided for free, where could they justify the higher price? Maybe the storage requirements, server busy times downloading, and most likely royalties to music producers. A few thoughts.